How long, I wondered, could this thing last? Still makes for a great shot! Does London have other kinds of days? We have greay and misty mornings but thank goodness the sun shines in the afternoon . The temperature , it is warm here. My close friend David would say "I love it" if he saw this picture. He loves everything about London including the weather. Much as I was glad to have mild, blue sky days on my last trip to London, there is something about those foggy days that make me happy. I guess it makes me want to do something stereotypical, like go to the pub or get a nice cup of tea. Can't say I miss living in a perpetually rainy climate! But still a gorgeous city! I like these kinds of days...but maybe that's 'cause they are so rare here. They sure do make for good photography, though. Nice moody shot! Nice shot but I prefer the sun! it's how i imagine London ... ;)Hope the sun will be back soon ! 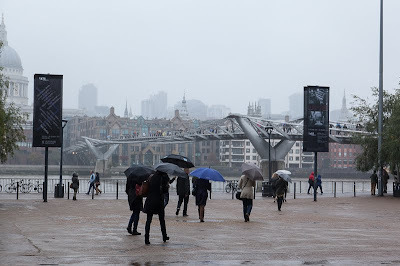 Its not that often that you get a whole day of rain in London. You get less rainfall then South Wales. Great summary of what London is. Expect you are specially pleases with this one. site of wahooart.com, that I use to help with my wall decorations. OPRA/BRUE-8LHUQV , that can be ordered on line and delivered to you. Hasn't the weather been just atrocious? I thought I was overdoing it this morning with a thermal vest, long sleeved shirt, body warmer, jacket, gloves and scarf but turns out I was just warm enough! Wish we had some of this over here in Southern California for a change!